Except for some crunchy granola scattered over my bowl of yogurt, I’m not the world’s biggest cereal eater. But Me & Goji just might make me one. 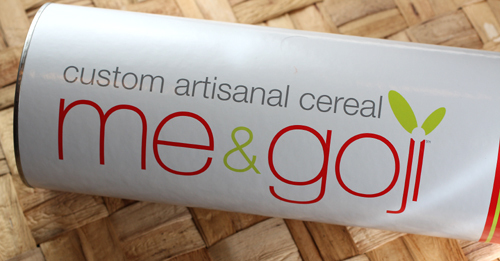 The New Hampshire custom, artisanal cereal company lets you design your own blend of cereal. We’re not talking Rice Krispies mixed with Special K and Cocoa Puffs. Instead, you can choose from more than 60 all-natural ingredients, including 5-grain muesli, “samurai wheat” bite-sized shredded wheat cubes, barley flakes, acai powder, goji berries, chia seeds, pine nuts, dried strawberries and sesame seeds. You can name your cereal and upload a photo to decorate the resealable, recyclable, heavy-duty tube it comes in. The company was started a couple years ago by two active, sporty guys — Alexander Renzi and Adam Sirois — who graduated from Northwestern University, where they played soccer together and longed for healthier food options to recharge with. Recently, they offered me a chance to design my own cereal on the house. I blended a mix of the “flax and flaked” (a blend of corn flakes, amaranth seeds, flax seeds, and sesame seeds) with granola, whole almonds, walnuts, sesame seeds and mulberries. 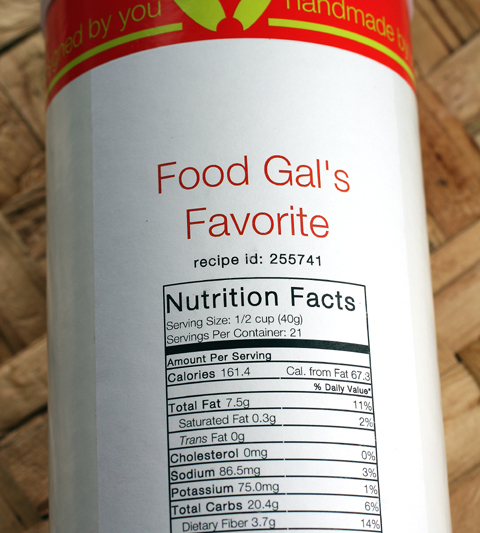 And I named it, “Food Gal’s Favorite.” But of course! I love this cereal. 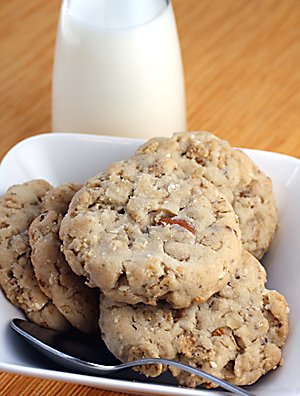 It is crunchy, nutty, full of varied textures and a far cry from the almost candy-like cereals on store shelves. It tastes fresh, healthful and delightful. According to the nutritional info on the back of the tube, my cereal mix weighs in at 161 calories per half cup (a lot less than most granolas I eat), with 7.5g total fat, 75mg potassium, 4.8g protein, 3.5g sugar, and 9 percent of the daily requirement of iron. My mix would have cost $13.90, plus $3.99 for shipping and 99 cents for the tube, which contains about 10 cups of cereal. There’s also a handy “recipe ID” number printed on the back of the tube, so if I want to re-order the same blend, I just enter that number on the Web site and it’s automatically added to my cart for check-out. 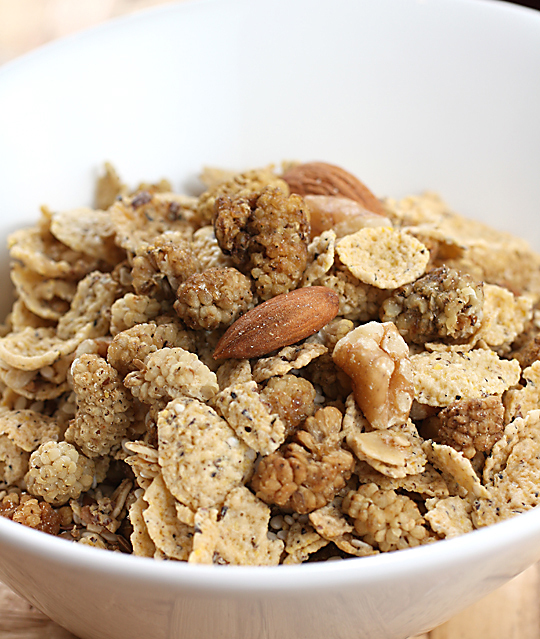 Contest: I’m thrilled to be able to give one lucky Food Gal reader a chance to try their own custom cereal blend for free. Entries, limited to those in the continental United States, will be accepted through midnight PST March 26. Winner will be announced March 28. Tell me your favorite cereal when you were a kid — and why. Best answer wins the chance to make their own Me & Goji cereal blend. Winner of the Previous Contest: In last week’s Food Gal contest, I asked you to tell me a time when coffee never tasted so good. 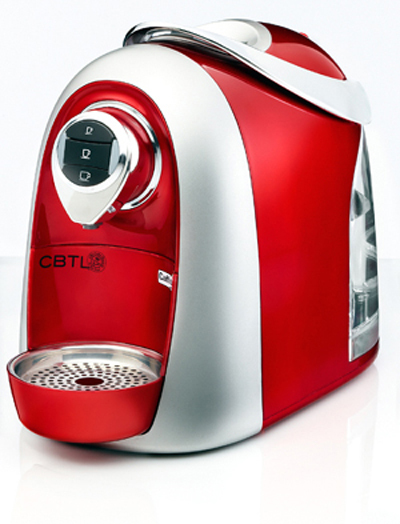 The winner will receive a sizzling red Kaldi single-beverage system by the Coffee Bean & Tea Leaf (a $149 value). I was floored by all the wonderful entries, which made it so hard to pick just one winner. But in the end, I had to go with this particular one. Favorite cereal when I was kid = I used to mix Waffle Crisp with Shredded Wheat cereals. A mix of healthy and sweet, and great textures. I loved being able to tote the dry cereals to school as well for a filling snack. Cinnamon Toast Crunch was my favorite cereal as a kid. But, since it was pricey, I never got it unless I happened to be at a friend’s house and they had it. 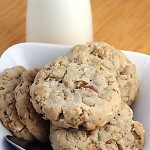 I prefer to eat is dry with a glass of milk on the side, so the sweet cinnamony goodness doesn’t get lost in the milk. And, even though I’ve moved on to less sweet cereals in adulthood, I still treat myself to a box once or twice a year. And it’s still delicious! I’ve definitely had my share of cereal as a kid and my favorite was Peanut Butter Crunch! I was also one of those strange people who liked their cereal as soggy as possible so I end up eating PB and milk mush. Love it! Without a doubt, Oatmeal Crisp was my favourite cereal. I loved the crunch, the variety of textures, and (of course) the sweetness. I haven’t eaten it lately, mostly because I’m trying to incorporate more ‘power foods’ (like chia! and flax!) into my diet, but I do cherish the memories of sitting at the kitchen counter with my father, while we both ate the cereal. I ate it out of a normal bowl, while he ate it, with a banana sliced on top, in a monstrous bowl, with a big spoon, wearing a ratty old baby blue bathrobe. My favorite cereal when growing up was Sugar Smacks. I was not a big cereal eater, because I preferred some nice scrambled eggs the best for breakfast. But I loved the name….made me think of it as lip smacking good. Even so, I was not too keen on replacing my scrambled eggs with cereal for breakfast, so I mostly ate it as a snack right out of the box. What a fun idea. (But $2 a cup? Yipe). I have to say I was surprised FoodGal’s cereal blend is so nutritious. I thought it would surely contain some pork belly! My favorite cereal was Graham crackers. You place half a dozen crackers in a bowl, press down to break them, add milk. It needs an experienced hand, as you want it broken up enough to eat but large enough that they don’t soak up the milk too quickly. What I loved about it was that it was as soft as oatmeal but with crunchy bits where the milk hadn’t reached. It’s comfort food now — I still have this when I a little reminder of home. Growing up, I ate frosted flakes but then in the mid-nineties, there was a commercial about Mr Mini Wheat going on a blind date. (a Canadian commercial). And so I ate Mini-wheat while looking for a real Mr Mini Wheat (sweet and funny on one side and serious/stable on the other 🙂 Finally found him! Kix was my favorite when I was a kid – we didn’t have any super sugary cereals in the house. When I’d been really good my mom would buy me a box of the Berry Berry Kix, but I wasn’t allowed to eat it for breakfast. Only dry as a snack. Guess what I overdosed on my first year or two away from home. I love cinnamon toast crunch. My mom wouldnt buy it frequently but when she did it was such a treat! Corn chex, but I put about a quarter cup of sugar on them! My morning breakfast has changed! Growing up in Asia, I don’t eat much (or any) cereal for breakfast when I was a kid. Cereals were like snacks, analogous to potato chips! I remembered the classic sugar-coated corn-flakes, Coco-Pops and Rice Krispies. My favorite cereal as a kid was Kellogg’s Rice Crispies Cereal – it does snap, crackle, & pop. Plus you can make rice crispies dessert. Yum, yum, yum. My Favorite cereal growing up as a kid was Raisin Nut Bran. My favorite was midnight snacks of cereal with super cold milk so that there are little frozen flakes. mmmmmmm. My favorite cereal as a (younger)child, was probably rice krispies. I would pour them into a tall glass with a little bit of milk and then drink/eat it with a long spoon. We don;t really eat a lot of sugary “kid-cereals” around my house, but one that I do like is cinnamon toast crunch, but it is slightly too sweet for me now to eat on a regular basis. Haha, I forgot to add why. Ummm, well I don’t really know. It could have been the fact that they “talked” to me, but it was probably because they tasted really good. My favorite cereal — and this is a tough one — was Reese’s Puff’s. I basically devoured anything chocolate: Cocoa Pebbles, Count Chocula, Cocoa Puffs were some of my other desired breakfast cereals. But a bowl of Reese’s was the best. The puffs actually tasted like chocolate and peanut butter, and as a child who constantly sneaked candy from her Halloween stash, I needed my early-morning sugar fix! My favorite cereal was Frosted Flakes. Sure, it was good…BUT…for awhile (in the mid-1960’s) they ran a promo that captured my undivided attention. In exchange for boxtops, they would send you ONE WHOLE QUARTER…yes, 25-cents. I was thrilled beyond belief. Do you mean, I ‘only’ needed to eat this silly box of cereal (or two or three) ‘just’ to get a real quarter??? Oh boy, they had my number! Still eat them, but stopped sending in the boxtops, lol. My favorite cereal growing up was Lucky Charms but my parents never wanted to buy it for me! They always got us a non-sugary cereal like Corn Flakes which I subsidized with a teaspoon of sugar and sliced bananas. as a kid my uncle would eat capt crunch pb flavor. gather a big bowl, pour in what seemed like half the box, drown it in milk, then take out 3 or 4 huge spoonfuls of peanut butter and throw it in the bowl. i thought that was the most disgusting thing I’d ever seen, until i finally tried it myself. so damn good. i still do that but with oatmeal now. Contest is now closed. Come back Monday to find out who won and for the start of a wonderful, new contest.